this podcast is teaching me a lot of things that I wanna know. Today's question for the Kwik Brain community is: how do you overcome math anxiety to the point that you can improve your finances? You might know Danica from her role as Winnie Cooper in Wonder Years, but what you might not know is that in addition to her lifelong acting career, Danica is an internationally-recognized mathematician, New York Times best-selling author and advocate for math education. Dealing with money and finances is one the most practical reasons to learn math—unless we are able to deal with numbers, institutions can take advantage of us without us even knowing it. Many of us have learned to avoid numbers after learning to fear math in school, but the good news is this can be turned around, no matter your age! In this conversation, we explain why avoiding maths can derail your finances, and why learning math is a form of self-care. We’ll give you some ideas for bringing fun into your math learning, and simple steps you can take to get started. We’ll tell you how math can help you feel in control of your life and make dealing with your finances fun. In today’s episode, I’ll be explaining how this challenge will help you to have better recall and brain. A common question from the Kwik Brain community is: why do most (more than half of all relationships) relationships fail? How can we move on from heartbreak? We grow the most through interaction and intimacy, but so many of us experience trouble along the way. The good news is by working on ourselves; we can change the patterns we’ve been seeing in our relationships and work towards a healthier, brighter future. Oprah has endorsed Dr.Shefali's work as revolutionary and life-changing. Her ground-breaking approach to mindful living and parenting has taken her books to the top of the NY Times best-sellers list. In this conversation, we delve into some of the biggest misconceptions surrounding relationships, why we need to invest in ourselves, and why romantic love is a delusion. We’ll explain how self-love can change your life and give you some suggestions to get started on your journey toward healthier relationships. Welcome to Kwik Brain Challenge #3! The Kwik Challenge is for people who want to create positive change in their lives—to take knowledge and turn it into power. Change doesn’t have to be difficult. All habit change starts with simple tiny steps, and before you know it you’ll be heading toward a new destination—the little things will add up to something much bigger! In today’s episode, I’ll be explaining how this challenge will help you to have better focus and memory. Welcome to the FIRST Kwik Brain Challenge! In today’s episode, I’ll be explaining how this challenge will help you to build a happier brain and a brighter life. Today, we're going to exercise your memory! To teach you this 2500-year-old memory technique, I'm going to use 10 Sparketypes from our episode #99 "Finding Work that Lights You Up with Jonathan Fields." If you haven’t already listened to that episode, I recommend you go back and check it out. In this episode, I'll teach you how you can use visual, auditory, kinesthetic and creative imagination to ignite your memory and remember the list of things you need to recall in your day. We did it! Episode 100 - where I’ll be sharing my top 10 takeaways from all our previous episodes! As you know, this show began with our mission of building better & brighter brains. Kwik Brain is not only interviews and information but a masterclass. We design every conversation to be practical, so you can apply what you learned that day. If you haven’t listened to every episode, then I highly recommend you do so because there are real gems in all of them. In today’s episode, I’ll give you 10 highlights of our Kwik Brain journey. This is a topic that a lot of us are struggling with. A lot of us feel the need to be always busy to feel like we’re accomplishing through the day. But is that the case? In this episode, we have Emily Fletcher with us to talk about what stress is and some simple, yet powerful tips on how to reduce stress so you can accomplish your goals. Emily is the founder of Ziva, the creator of The Ziva Technique and regarded as the leading expert in meditation for high performance. The New York Times, The Today Show, Vogue, and ABC News have all featured Emily’s work. She’s been named one of the top 100 women in wellness to watch, has taught more than 15,000 students around the world and has spoken on meditation for performance at Google, Harvard Business School, Summit Series, Viacom, Wanderlust Festival & The Omega Center. Ziva graduates include Oscar, Grammy, Emmy and Tony award winners, as well as NBA players, CEOs, busy parents, entrepreneurs and everyone in between. Tune in as he shares how you can activate your alter egos to get things done. How do you love learning? In this special “happy valentine’s day” episode, I’m going to share with you 3 strategies you can apply to fall in love with learning. Whether you already love learning or looking for ways to integrate more learning in your life, these 3 keys will help you to achieve the desired outcome with learning. Enjoy! Have you noticed the difference when communicating with women and men? Are men really from Mars and women are from Venus? In this episode, we’re coming to you live with Dr. Stephanie Estima, who’s back with us to decode women’s brain. Dr. Stephanie is a big-hearted, energetic, and compassionate healer dedicated to changing lives through evidence-based health strategies like chiropractic, nutrition, fitness, and mindset. She is the owner and clinic director of The Health Loft, a chiropractic clinic in downtown Toronto. She has been in private practice for the last 15 years where she has had immense satisfaction serving the hundreds of families she calls practice members. She also shared with us how to have a shredded mind in the episode #73 so be sure to check that out if you haven’t done so yet. Today’s business climate has been marked by the rise of organizations built on the principles of exponential thinking—think Github, Airbnb, and Uber. Companies stuck in old linear thinking patterns, like Kodak, have gone out of business. We can no longer rely on repetitiveness and old ideas to get us through—to achieve success in such a competitive climate, we need to be thinking bigger, and constantly changing and developing. In this episode, we welcome back special guest Salim Ismail! If you haven’t already listened to my first conversation with Salim, I recommend you listen to episode #89. Imagine if you could improve the performance of your organization by 10x — what would it look like? How can we raise the collective intelligence and wisdom of our organizational teams? Today’s guest Salim Ismail is here to tell us how to transform the way your company does business. As the founder of Singularity University, a board member at XPRIZE, and an internationally bestselling author, Salim has built his career on thinking big and teaching others about industry disruption and exponential thinking. We cover a lot of ground in this short conversation. We review what makes an exponential organization, explain why new ideas tend to be rejected by legacy organizations and why this is causing stress around the world. We’ll go over some examples of businesses failing due to their inability to take on exponential thinking, and explain why this happens. We’ll talk about how to successfully transform organizations and solve problems. Lastly, we’ll talk about creativity and share a great hack to completely change the way you thinking about saying ‘no’ to ideas. How do you have better focus? How do you improve your memory? How do you improve your thinking ability? What are the best foods for your brain? What you eat matters, especially for your gray matter. And who better to have this discussion with than Dr. Lisa Mosconi? She’s the author of an incredible book called, Brain Food, a must-read for anyone interested in having a healthy and powerful brain. Her research is well known regarding the early detection of Alzheimer’s disease in at-risk individuals using brain imaging techniques such as positron emission tomography (PET) and magnetic resonance imaging (MRI). She is passionately interested in how the risk of memory loss and Alzheimer’s disease can be mitigated, if not prevented through the combination of appropriate medical care and lifestyle modifications involving diet, nutrition, physical and intellectual fitness. In this episode, we’re taking you to the kitchen and share with you foods you can eat right now to boost your brain health and the foods you should avoid. How do you become a multi-sensory learner? You may be asking, “what is a multi-sensory learner? Is it going to help me with my focus? Is it going to help me retain information better? Is it going to make me a creative thinker?” And my answer is astounding, YES. Multi-sensory learning is the idea that individuals learn better if you were taught using more than one of your senses. When it comes to learning, the more senses you stimulate, the more you’re able to learn and attain new knowledge. In this episode, I’m going to share with you different learning styles and how you can apply them into remembering abstract concepts like numbers. Studies are indicating that loneliness leads to Alzheimer, dementia, and other mental challenges. Even though we’re more connected than ever before via social media, the level of loneliness people feel have been arising. To dive deeper into this topic, I have my good friend, Radha Agrawal, in the studio today! Radha is a community force, successful entrepreneur (Co-Founder THINX, LiveItUp), author, globe-trotting speaker, DJ, inventor, and investor. Her new book BELONG answers the questions, "how the heck do I find my people?" and "How do I create large and meaningful communities in the real world?". She spent 18 months synthesizing her key methods for community building, peeling back the curtain on exactly what she and her team did (and continues to do) at Daybreaker so that anyone interested in creating their community could have a blueprint for how to do it. I wanted to make this special episode to tribute to our superhero friend, Stan Lee. I’m bringing this episode to you from New York City, where he co-created some of my very favorite superheroes of all time. In this episode, I’m going to share with you FOUR superpowers, mental/mindset superpowers, that I learned from the legend himself. So many of us work on our physical health—whether that means going to the gym or for a run—without being aware of the brain health benefits we’re receiving. I’m excited to welcome back today’s guest Shawn Stevenson—founder of the Model Health Show Podcast and health expert—to tell us how we can boost our brain potential through quick and simple physical exercises. Physical training is a powerful way to boost your brainpower and creativity. Simple exercises like push-ups, squats, daily walk, and sprints can help you improve so many aspects of your overall wellbeing and brain function, from sleep to creativity and brain cell production. There’s a lot of confusion out there about strength training, but the truth is that after years of evolution our body needs and expects us to work hard and lift heavy things—and it doesn’t have to mean complicated hours of workouts at the gym! Regardless of our age and ability, we can train to prevent our physical and mental muscles from atrophying. In the process, we can improve our mental strength, resilience, sleep, mood and cardiovascular health, among countless other health benefits. If you’re looking for a simple and effective plan to improve your body and brain health, today’s podcast is for you. In this episode, we’ll explain the benefits of strength training and how it is connected to a happier, healthier brain. We’ll walk you through some quick exercises you can incorporate into your day, and explain how your sleep, productivity, and creativity can be improved in a few minutes a day. We’ll also be doing a deep dive into the top four exercises you can start doing today to boost the health of your mind and brain! Welcome back, Kwik Brain! In this episode, I’m going share with the secrets to mastering and remembering numbers. Numbers are everywhere. It’s like a universal language. Telephone numbers, credit cards numbers, zip codes, PINs, passcodes, birthdays, it’s everywhere. But here’s the challenge. A lot of people have difficulty remembering numbers. Think about something simple like phone numbers and how many phone number you used to be able to remember like 10-15 years ago before we had smartphones. Now, we’re outsourcing our brains to technology. Granted, why would you want to remember dozen and hundreds of random numbers like phone numbers when you can put into your smartphones? But have you’ve ever needed to memorize and hold that information in your working memory? The brain is like a muscle. It grows stronger with use. A lot of us have this flabby “remembering-numbers” muscle. So if you’ve been feeling your memory is not as strong as it used to be, you can follow along in this episode to get a great mental workout as I give you several tools to remember numbers. Meditation is a simple path to a healthier, more productive life. I’m excited about today’s conversation with guest Ariel Garten—founder of MUSE, scientist, and expert on mindfulness and entrepreneurship—who is here to tell us how meditating for just a few minutes a day can change our relationship with our brain. Whether you’re an entrepreneur, an office worker or a parent, learning to be present is how you’ll get the most from your day. By learning how to meditate, you’ll be able to increase the amount of time you spend being truly present in the now. There’s a lot of confusion out there about meditation, but meditation is simply an easy practice we can all do to make our mind better! Stressful thoughts can lead to a rollercoaster ride of emotions that dictate our behaviors, but we can break this cycle by learning to build a better relationship with our brain. Meditating for just a few minutes a day can teach us to be aware of our thoughts and reign our emotions in when we need to—we can learn to experience emotions as a sensation that will quickly pass, and control our thinking! In this episode, we’ll give you some great basic information about mediation, explain the difference between meditation and mindfulness, and walk you through a quick exercise to get started. We’ll cover how to integrate meditation into your everyday life, explain why meditation is vital to improving your performance and your health, and hear how Ariel is revolutionizing meditation with her MUSE device. Today’s podcast is all about the power of imagination—and we welcome special guest Beth Comstock! As the pace of change increases exponentially, we’re all going to be searching for ways to solve problems we’ve never had before. Today’s guest Beth Comstock—one of America’s most successful businesswomen, author, and a previous leader of innovative change in her role as Vice Chair at GE—is here to tell us why our imagination and creativity are powerful and essential tools to build a new future for ourselves. Fear can hold us back from making the most of our imagination, as can an unhealthy attachment to safe, familiar routes. So many people don’t take that first step towards making the idea they have in their heads a reality because they’re afraid they won’t be perfect or successful. But as Beth tells us, embracing uncertainty and learning as you go is the only way to move towards growth and success. In this episode, we’ll explain why imagination, creativity and white space are so important, and why creativity isn’t just something to be done in your free time. We’ll discuss why so many people don’t use their imagination to its full potential, how to cultivate imagination and the importance of vision and story in achieving your goals for a brighter future. This week’s podcast is all about building a healthy brain—and we welcome special guest Dr. Daniel Amen! This is the final part of a special three-part Kwik Brain series with Daniel, where we’ll be walking you through his seven steps to a healthy brain. Many of us struggle with focus, mental fatigue, brain fog, and memory loss, and today’s guest Dr. Amen—one of America’s leading psychiatrists who has helped millions of people change their lives and is a ten-time New York Times bestselling author—is here to tell us not only how to counter these problems, but how to build a healthier brain. Our brain controls literally everything—our careers, relationships, health, and happiness. This talk is about getting some inspiration and instruction on how to unleash the power between your ears. Dr. Amen’s book Change Your Brain, Change Your Life has impacted so many people's lives, including mine. It’s an honor to have him as an extraordinary guest on the podcast, and today we’ll be diverging from our usual guest interview format in order to give you access to an exclusive talk by Dr. Amen that we hosted at a private gathering for our Kwik Brain students. In this episode, Dr. Amen will tell what we should be avoiding, and what we should be doing, to achieve great brain health. As Dr. Amen says in the introduction: “if you pay attention to me, this information has the ability to improve everything in your life”—so don’t forget to take lots of notes and enjoy! In this episode, I’m coming to you live from Instagram! Have you ever felt or done something like this before? You go to a seminar, listen to a podcast, read a book, but nothing changes. Knowledge is not power, but it has the potential to become power only when you apply it and use it. All the books, podcasts, seminars, online programs, coaching; none of it works unless you work. So I’m here to share with you the 3 keys to take knowledge into action because if you don’t act, then you’re not going to get the results. How do you have a shredded mind? You can look at somebody’s body and see that person’s physiques, in terms of abs and biceps. But with the brain, you can’t see how fit it is off the bat. So how do you obtain it and how do you know when you have it? To answer this question, we have a very special guest, Dr. Stephanie Estima, who is an expert in this field. She is the founder of The Health Lost, a chiropractor, a mother, and a biohacker. Listen in as we talk about the steps to getting a shredded mind. How do you deal with mistakes? This is such an important question that you’ll want to take notes on this, and I recommend you listening to it more than once. We all make mistakes. It’s easy to forget that when we’re in the midst of a mess-up. But it’s impossible to avoid miscalculations, mishaps, both big and small. And have you found that the busier you are, the more mistakes you’re likely to make? Maybe you’ve hurt someone’s feelings by saying the wrong thing at the wrong time. Or left the water running and flooded your home, or fumbled the presentation in a meeting, or maybe you lost a client. So how do you bounce back from a mistake? In this episode, I’m going to share with you 3 kwik things you could do to put mistakes behind you. A social dynamics expert and podcast host, today’s guest Jordan Harbinger has years of experience coaching clients to navigate interpersonal relationships and build on their connections. The way we communicate with others on a daily basis contributes over time not just to our personal brand, but the circles of connections we have. Small, thoughtful messages sent daily can completely change the shape of your networks and build relationships with everyone from distant acquaintances to close family — before you even need to rely on them. In today’s world many of us have learnt to engage solely on social media — think lazily clicking a heart to respond to news from a friend along with hundreds of others rather than picking up the phone to congratulate them — and we are missing out on all the benefits that come with properly nurturing our connections and relationships. In today’s conversation, we’re going to talk about the best ways to nurture better relationships and ensure you are unforgettable to other people. We’ll give you some practical tips on sending thoughtful messages to others. We’ll leave you with some ideas for re-engaging with your contacts, quickly generating rapport in social situations, and becoming a better listener. This week’s podcast is all about the best productivity tools— and we welcome back special guest Ari Meisel! Modern life is so busy that we all feel like we’re constantly hustling yet still falling behind. We all want more resources and advantage. And we especially want to know the secrets of how to use our minds better to become more productive. A productivity expert, CEO and best-selling author who has built his career on teaching others how to work smarter—not harder—today’s guest Ari Meisel is here to tell us how we can all learn to be more effective in our daily lives and free up time for the more important things in life. So many of us have been taught that being productive is all-important, but the truth is that we should be thinking about how we can be more effective—that is, learning how to do more with the resources we already have, rather than burning out trying to produce more. Innovation never comes from having too many resources—it comes from restricting your resources, thinking innovatively about effectiveness and asking yourself: what’s a better way to do this? In this conversation we talk about the best productivity tools to amplify your effectiveness and save you precious time—we’ve included links in our show notes to the various tools Ari mentions. We talk about the essential steps to becoming more effective—managing your communication, project management, and processes to streamline your operations and increase your productivity. ** Do you want to stay up to date with every new episode and get my brand new Kwik Brain Accelerator Program? Go to www.KwikBrain.com/podcast to get instant access. This week’s podcast is all about activating your second brain— and we welcome back special guest Naveen Jain! Just how important is our second brain—our gut? How much does our gut influence our mind? How important is our gut to our health? Why are we spending trillions on healthcare only for many of us to get sicker? Are our genes our destiny? An international leader in industry disruption and founder of groundbreaking companies such as Viome and Moon Express, today’s guest Naveen Jain has built his career on thinking big, with years of experience applying exponential thinking to a variety of industries, including the healthcare industry. Our gut is one of the most crucial determinants of our health. If something goes wrong in the gut, it can affect our thinking, decision-making, and risk of disease. Modern living and new chemicals are penetrating our gut lining, meaning that our body is dealing with foreign bodies never before seen—and this is resulting in heightened rates of inflammation and illness despite our ever-rising rates of investment in healthcare. In today’s conversation, we talk about why you should trust your gut, explain how much control our gut has over our bodies, and explain why genes are not our destiny. We’ll cover the diseases chronic inflammation has been linked with—think everything from Alzheimer's to depression—and leave you with some ideas to increase your knowledge of your health. * Please note, this episode is educational only and not intended to diagnose or treat medical conditions. Please consult your healthcare provider if you have any questions or concerns. Modern life is so busy that we all feel like we’re continually hustling yet still falling behind. We all want more resources and advantage, especially to know the secrets of how to use our minds better to become more productive. In today’s conversation, we talk about the difference between productivity and effectiveness, why the brain works better with constraints in place, why you should outsource your brain, and why you should take a hard look at how you are spending your time and money. If you love this episode, watch out for our upcoming second episode with Ari, where we’ll discuss the technology he uses to maintain his incredible levels of productivity. We often get questions about how to calm and quiet one’s mind in our Kwik Brain Podcast FB Group. We no longer live in the age where we measure success by profit or prestige, but rather by a peace of mind. Do you agree? Your brain is not designed to work at full steam all the time. So regularly simmering down with these tips and hacks is a brilliant move for your wellbeing in life and career. Perhaps you wear a lot of hats and have a long list of to-do’s, and your monkey mind can get out of control. And a majority of the time, the thoughts in our heads aren’t always positive. If you’re struggling with that internal chatterbox, then this episode is for you. I’ll share with you simple questions and tips to get your mind in a more peaceful place when you need it the most. ** Also, visit www.JimKwik.com/podcast to view all the show notes. In previous episodes, we’ve talked about brain superfoods and what we should be eating to power a healthier, happier brain. Today’s show takes the conversation a step further as we talk about when we should be eating, and how fasting can impact our longevity and brain health. A common question from the Kwik Brain community has been how we can improve our brain functionality through nutrition and diet. A respected health and science journalist and author of a best-selling book on diet and brain health, today’s guest Max Lugavere has years of health and diet research experience to give you the best advice on improving your brain function through nutrition. The food we eat matters to our grey matter. When and what we eat can affect our memory, our thinking, our lifespan and our happiness. In today’s world, many of us are chronically eating, which is creating ongoing impacts and stresses on our bodies and brains — this makes sense if you consider we evolved as hunter-gatherers, eating only when we were able to find adequate food. In today’s conversation we talk about some key nutrients for healthy brain cells, cover Max’s list of top genius foods you should be eating on a daily basis, provide a framework to guide when you eat and explain the effect of fasting on your mental state and metabolism. We’ll explain what current research is saying about fasting, and how you can improve your health through connectedness. *Do you want to stay up to date with every new episode and get my brand new Kwik Brain Accelerator Program? Go to www.KwikBrain.com/podcast to get instant access. In today’s episode we’ll be addressing the much-talked-about mind/body connection and exploring how optimizing our body function, posture and movements can affect our minds and improve our brain power. There are times in life where you might find yourself overwhelmed. You might have a long to-do list, insane demand, and not enough time. All these action items may appear to be high priority tasks, and you’re carrying the weight of it all. But it can sometimes feel a little bit unbearable. You may feel like you’re being held back or tired of the pressure, so I understand where this question is coming from. If you’re just like the rest of us, you want to become more efficient and smart. You want life to feel easier, and not so hard. Here’s my “Kwik tip” on how to handle when you feel overwhelmed and unsure of what to do next. What is the secret to asking great questions? If you’re a long time or a new listener to my training, you know that I always tell people that the questions are the answer. If you want a greater understanding and comprehension when you read, then ask better questions. In today’s episode, we’re going to talk about how to ask better questions that will give you better answers. And I can’t think of a better person to talk about this than my friend, Cal. Calvin "Cal" Fussman is an American journalist and author. He is a Writer at Large for Esquire magazine, known for the What I've Learned column, where he interviews leaders in various fields, which have included Mikhail Gorbachev, Jimmy Carter, Ted Kennedy, Jeff Bezos, Richard Branson, Jack Welch, Robert De Niro, Clint Eastwood, Al Pacino, George Clooney, Leonardo DiCaprio, Tom Hanks, Bruce Springsteen, Dr. Dre, Quincy Jones, Woody Allen, Barbara Walters, Pelé, Yao Ming, Serena Williams, John Wooden, and Muhammad Ali. This is a powerful episode, and I hope it will help you to re-activate your curiosity and creativity. What the heck should I eat for my brain? 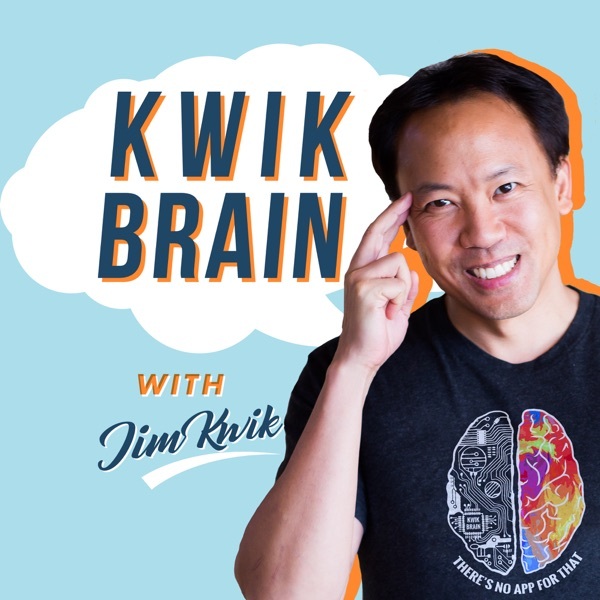 If you’ve listened to the past podcast episodes, you know the most popular one was “The 10 Keys to Unlocking Your Kwik Brain.” While 1/3 of our brain is pre-determined by genetics and biology, the 2/3 of it is entirely in your control. And the first thing on that list is the food that you eat. But with so many choices (or lack thereof) these days, what should we eat to have an optimal brain? To dive deeper into this subject, we have a very special guest today. Dr. Mark Hyman is a director of Cleveland Clinique, a center for functional medicine, 11 times bestselling author, along with his new book, “Food, What The Heck Should I Eat?”. Listen in as we go over the top 3 brain foods you should eat AND 3 foods you should avoid. This episode is not intended to diagnose or treat any medical condition, and it’s educational only. Please consult your healthcare provider if you have any question or concern. When you’re reading something, do you ever lose focus? Do you ever get tired and fatigued? Do you ever get frustrated? When people are reading, one of the biggest complaints I hear is that they get tired while reading. To help you with that, I brought my sleep doctor and one of my dear friends, Dr. Michael Breus, on today’s episode to talk about sleep, reading, and chronotypes (the science of best times WHEN to do things for YOUR specific body type). When you think about resilience, you think about the capacity to cope with stress and adversity. But it’s not necessarily a trait people are born with. The good news is that it involves behavior, thoughts, habits, mindset, and actions that we can all learn and develop over time. To answer this important topic, I want to introduce you to Tara Mackey. She is a scientist, a #1 bestselling author of “Cured By Nature,” a health & wellness advocate, and an amazing human being. Her story is absolutely incredible. Listen in as she shares her techniques to unlock your mind and master your habits so you can be more resilient throughout your day. Be sure to check out her brand new book, “Wild Habits,” at www.wildhabitsbook.com and you can find her @taraamackey on socials. The more you learn, the more dots you can connect. How do you become an exponential thinker? What does it mean to be an exponential thinker or a really BIG thinker? We talk a lot about how our life is a reflection of our thinking. This is the millennium of the mind. We get paid to think. It’s not our brute strength, but brain strength. I’m very honored to bring my friend, Naveen Jain, on this episode to share with you some of the ideas to becoming an exponential thinker. He is a very successful entrepreneur, philanthropist, and created a number of businesses including, Moon Express, the only company in the world given permission to leave Earth’s orbit and land on the moon. Strap in as we share some of the principles and ideas of exponential thinking, and how you can train yourself to think exponentially. Most of us have days where we feel depleted, helpless, overloaded, where you don’t want to get out of bed, and much less pursue your dreams. So in this episode, I would like to talk about the signs of burnout AND the solutions you can apply to negate them. I get a lot of questions about learning, brain health, and etc. in our private fb group, and I came a crossed this question we haven’t addressed yet. I know it’s hard to imagine living in a world without your smartphones and computers, but what does living in a sea of electronics do to our brains? I was recently at an anti-aging conference where I shared the stage with Dr. Joseph Mercola, who can offer very strong advice in this area so I took the opportunity to ask him some questions about EMFs and the effect it has on the brain. In this episode, Dr. Mercola will share tools and strategies you can use to protect yourself and your family from possible harmful effects of EMFs. Dr. Mercola is a multiple New York Times Bestselling Author, and his website www.Mercola.com is one of the world’s leading natural health website with millions of monthly visitors. This interview is not intended as medical advice. Please do your research and talk to your healthcare practitioner for any questions you may have. Do you want to stay up to date with every new episode and get my brand new Kwik brain Accelerator Program? Go to www.KwikBrain.com/podcast to get instant access. We all want a brain that’s healthy and agile. In this book, I dedicated a chapter on lifelong learning and how to use that to keep your brain young, agile, and adaptable. We can keep our brain young by developing new connection through novelty and nutrition. And in this episode, I want to talk about some of the exercises you can do to create more connections in your brain. Find your motivation to learn something new. Read books, not just articles and emails. Turn your car into University on wheels. Stop telling yourself you have a poor memory. Use your creativity to memorize a list. Use a visual pacer to read. Sharpen your brain during leisure time. Boost your pre-frontal cortex by setting goals. Boost your brain’s flexibility by reflecting. You can pick 2 or 3 new activities from this list to add to your day. Which ones are you going to incorporate? Cheers to your ageless brain! In this episode, my good friend Vishen Lakhiani gives us his best strategies to create smart learning organizations & teams. Happy Valentine's Day! This is a special episode and it's all about loving your brain. In this episode I sit down with Vishen Lakhiani. Vishen is the founder and CEO of Mindvalley. Vishen is a long time friend of mine and we go over exactly how to find your life's vision. This is Part 2 of Fix A Broken Brain with Dr. Hyman. If you haven't listened to the first episode yet, be sure to do so! In this episode, Dr. Mark Hyman goes in depth to help us understand how our brain works and also how to fix it when it's "broken". This is a special episode for us! We are celebrating our 50th Episode. Thank you so much for all of the support and love you've given us over these 50 episodes. In this episode, I will give you some awesome tactics to Master Your Mind! In this episode Steven Kotler and I go in depth on focus and flow. Both focus and flow are common traits among top performers and we're going to break down some of the best ways to improve these for yourself. Gratitude is scientifically proven to improve how you feel and rewire your brain. I know for me it's one of the most powerful habits I practice every single day. In this episode I will show you how to implement gratitude into your daily life and exactly how it can rewire your brain. Focus is essential. Every leader of industry and high-performer understands and utilizes focus to achieve massive results. On this episode we have Steven Kotler to give us his best hacks to improve your focus and flow. In this episode I have on my good friend Dr. Michael Breus, to discuss the best ways to improve your memory with extremely simple tactics! Do you ever forget your passwords or PIN numbers? Bank, credit card, airlines, online courses, shopping, e-mail, social media....With the plethora of websites and services that you probably have accounts for, how is anyone supposed to remember them all? In this episode I go in depth on the best ways to instantly remember all of your passwords and pin numbers! In this episode Dr. Michael Breus is on to discuss the best time to learn, read and study. You must first understand the four chronotypes, and Dr. Breus will help you identify which one you are. In this episode I will teach you an exercise you can use at any time to enhance your problem solving, and help you make decisions quicker. In this episode I will teach you five ways to organize information efficiently and effectively. The more efficient you can store and organize information the easier it is to access! Do you ever have negative thoughts creep up on you out of nowhere? I myself suffered from this for quite a long time until I learned a few things. How to identify these thoughts as they arise, and what to do with them. In this episode, Nick Ortner shares his best practices for crushing "ANT's" Automatic Negative Thoughts. Join this 3-part podcast with New York Times bestselling author and master high performance trainer Brendon Burchard in a rare conversation on activating the 10 human drives that shape everything you think, feel, and do in life. According to Brendon, our brains are hardwired to meet very specific human drives, and learning to harness and activate these drives is the secret to success and happiness. Make sure you subscribe so you receive the next two parts of our conversation. And pick up a copy of Brendon’s new book - High Performance Habits: How Extraordinary People Become That Way. Whether you want to get more done, lead others better, develop skill faster, or dramatically increase your sense of joy and confidence, the habits in this book will help you achieve it. The words we use influence the way we interpret and explain the world around us. In this episode I teach you an amazing method to Learn Vocabulary Faster and Memorize Words In Seconds. Genius leaves clues. In this episode, I give you my 4 keys to genius. Negative self-talk often times can be the biggest detriment to us reaching our full potential. The mind can be trained and used to produce astounding results. In this episode I teach you how to end negative self-talk for good, like magic. Every top performer knows that setting the RIGHT goals is essential to massive success. In this episode, Olympian Dr. Jeff Spencer teaches you how to do exactly that. One of the most common questions I’m asked is about reading comprehension: how can I boost my understanding of what I read? In this episode, I reveal the 3 Rs to boosting your reading comprehension. How do you sleep even smarter? Sleep expert Shawn Stevenson is back to answer some of your burning questions on how to get the rest your desire and deserve! Tune in and discover: what to do when you wake up in the middle of the night, how to turn your bedroom into a sleep sanctuary, and how to deal with jet lag. Do you know what day of the week your birthday falls on? What about your anniversary or Christmas? Learn a brain exercise that will help you know that without a calculator...all while keeping you mentally fit! In this episode, Jim talks with Scott Flansburg, also known as The Human Calculator®. Scott is a multi-award winning Guinness World Record Holder for the "Fastest Human Calculation" which includes correctly adding a randomly selected two-digit number (38) to itself 36 times in 15 seconds without the use of a calculator (faster than a person could do with a calculator). When you get a bad night’s sleep, how do you feel the next day? A lack of sleep impairs several cognitive processes and hurts your ‘Kwik Brain’ performance. In this episode, sleep expert Shawn Stevenson reveals his 3 tips to help you sleep smarter. Whether you want to get into bed more relaxed or get out of bed more rested, this episode will help you there. Have you ever wondered how actors can memorize a movie-length script? In the second half of this two-part episode, I reveal the “Hollywood Secrets” to memorizing anything word-for-word. Have you ever wondered how actors can memorize a movie-length script? In the first half of this two-part episode, I reveal the “Hollywood Secrets” to memorizing anything word-for-word. In this episode, you'll hear from ‘busyness’ expert Juliet Funt. She discusses the importance of the ‘white space’ in your schedule and how to calm a busy mind. In today’s world, communication is more important than ever - but we spend less and less time listening to each other. In this episode, I teach you my 4 keys to becoming an active, deep listener. Steven Kotler is a human performance expert and the author of the book “Stealing Fire.” In this episode, Steven reveals 4 tips for hacking flow so you can learn faster, perform better, and be more productive. In this episode, productivity expert Julia Roy reveals 3 ways you can use your physical environment to boost productivity. If you win the morning, you win the day. In this episode, I take you through my typical morning routine and reveal habits you can use in your daily life. Some of the greatest thought leaders in human history made some of their greatest discoveries while dreaming. Learn how you too can remember dreams with my 6-step process. Most of us forget 80% of what we learn in 48 hours. In this episode, I show you how to combat that by taking notes efficiently and effectively. One of the biggest obstacles to reading quickly is subvocalization - the inner voice in your head that reads with you. In this episode, I reveal 3 hacks to reduce subvocalization and increase your reading speed. Have you ever wanted to give a speech that truly resonated with people? In this episode, I teach you my tricks for memorizing an entire speech without notes. Have you ever put off something urgent but unpleasant in favor of more pleasurable tasks? We've all been victims of the super-villain of procrastination...but we don't have to be. In this episode, I share my tips on booting procrastination from your life. Don't Forget, Subscribe & Review. In this episode, I sit down with my friend Dave Asprey. Dave is the CEO of Bulletproof, inventor of Bulletproof Coffee, and author of the new book “Head Strong.” Dave shares some of his best performance hacks for getting and staying ready, alert, and focused. Most of us need to memorize lists of words - whether they're names, speeches, or languages. But what's the best way to do so? In this episode, I explain why we remember things and my simple technique to help you memorize lists, speeches, names, and much more. Don't forget to Subscribe & Review. Are you overloaded with too much to read and not enough time? In this episode, I give you the tools you need to read faster and retain more than you ever thought possible. Don't to forget to Subscribe & Review. What's the sweetest sound to someone's ears? Their name. In this episode I give you my greatest tactics to remember the name of every single person that you meet. I can't stress how important this is. Remembering the name (and using it) of everyone you meet shows that you're more engaged and that you valued your conversation in the eyes of the other person. You are what you eat - so how can you have an amazing brain? In this episode, I share the top 10 brain foods I eat every day (with recipes!) - and how to remember them without writing them down. It's a memory technique you can use anytime, anywhere. For two decades, he has served as the mental coach to students, seniors, entrepreneurs, and educators, and as advisor to many of the world’s leading CEOs and celebrities. After a childhood brain injury left him learning-challenged, Jim created strategies to dramatically enhance his mental performance. He has since dedicated his life to helping others unleash their true genius and brainpower to learn anything faster and live a life of greater power, productivity, and purpose. Jim’s cutting-edge techniques, entertaining presentation style, and impressive brainpower feats have made him a frequent and highly sought-out trainer for top organizations, with clients that include Virgin, Nike, Zappos, SpaceX, NYU, GE, Fox Studios, Harvard University, and Singularity University. KwikLearning.com’s online courses are used by students in over 100 countries. Jim has shared the stage with global leaders from Sir Richard Branson to the Dalai Lama. His work is featured in media worldwide, including the New York Times bestselling book, Use Your Brain to Change Your Age. Reading books is one of the best ways to learn - but how many books do you read each year? Most people only read a few. But the average CEO reads 4 or 5 books a month! Learn how you too can read like a CEO with my foolproof plan to read 52 books a year...no speed-reading required! In this episode, I reveal the techniques I teach my world-class celebrity and CEO clients to help them learn ANYTHING faster. Whether you're a student who needs to learn a new subject for a test or a career professional who needs to make a deadline, accelerate your learning with the mother of all memory techniques.